Based on our efforts with the IS-F we have modified the application to suit the larger framed cousin and stepped it up a little bit in the process. The reviews are in and this setup really performs! Take a look at our feedback on the initial kit shipped. 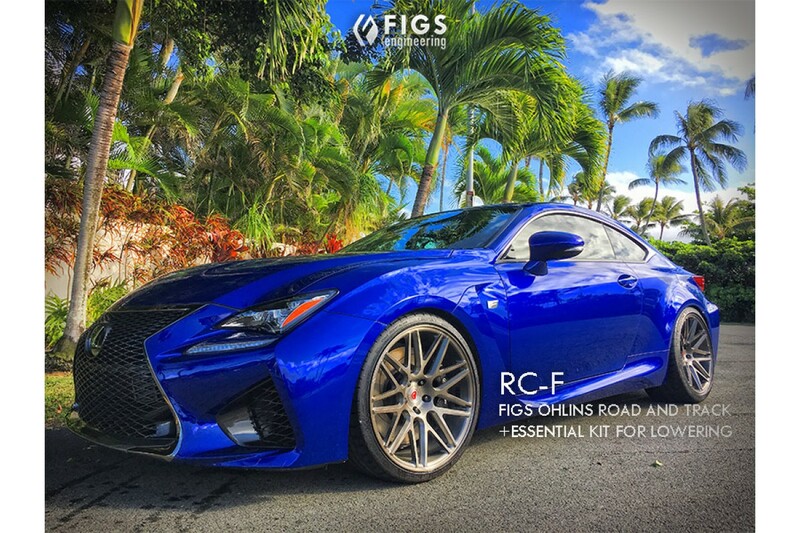 Quickly gaining praise as a worthy competitor of its lighter rivals, the RC-F is quickly finding its place in the performance GT coupe category and also to many local racetracks. Raced in Touring Car from the UK to Japan, the Öhlins Road&Track suspension provides comfort and control for a full car and a full throttle. Fits the GS-F as well. This balanced suspension package provides racetrack performance with street comfort, and features conventional shocks both front and rear. Each front shock includes top mount, height adjustor, preload adjustor, length adjustor , single bleed adjustor, model-specific spring rates, and dust covers. The rear Öhlins shocks each feature a single-bleed adjuster, preload adjuster, properly rated coil spring, dust cover, and utilizes the factory top mount. Both front and rear components have Dual-Flow Valves (DFV) and are light weight, corrosion resistant, fully rebuildable for a lifetime of service, and come with a two-year limited warranty. -World - renowned Ohlins quality, form fit and finish. - Front and rear single-adjust dampers with both preload adjustment and adjustable collars for ride height. Offering the widest range of ride heights of any coilover system on the market. -Road and Track dampers feature DFV (dual flow valves) for both spirited driving and daily comfort and are completely serviceable-rebuildable. -Coilover assemblies feature rubber damped upper hat mounts and lower mounts to provide an OE-like experience. -Swift Springs, the best most accurate linear coilover springs available. -damping extension adjustment for the rear so that you can reinstall your trunk liner and still make adjustments to the shock damping. -options to use our rear lower control arm replacement which should save weight over the factory arm given the spring perch/pocket no longer be used. It is adjustable as well for suspension geometry change when lowered. This will be a custom order product. -Completely re-valved to FIGS Specs in the USA. -Swift springs front and rear featuring thrust sheets for free coil rotation under load . -Isolated shock cap on top for easier adjustment and isolation from the top hat. -Made for the Street: Aluminum anodized bodies, crack-free chrome plating on shafts and salt spray tested mean these are made to last in real world conditions as well as the track. Shaft boots are also included. The WIDEST ride height range of any offering: Ride height independently adjustable of spring preload and preload ride height adjustable means we can cover ride heights above stock down to a 3" drop (rear). -Front Upper Hats included with rubber bushings. -Rear Shocks reuse factory upper hats and bushings. Complete machined hats are also available. -Single adjustment for low- speed damping compression and rebound. -Dual-Flow Valving for performance and comfort. High-speed damping controlling the internal shim stack. -Spanner wrenches and hardware included. -Saves about 30lbs over stock components.